In a recent interview, Uncle Max, head of Culture is Life said, "Strengthening Indigenous youth back to the land and culture gives [Aboriginals] a sense of connectedness to self, land and spirit". It has been almost 30 years now since the Royal Commission into Aboriginal Deaths in Custody, when we as a nation first publicly addressed the suffering of what was to that time an, "excluded Indigenous underclass". For the people involved, the Royal Commission took a long time to work its way around Australia (the Royal Commission actually ran from 1987 to 1991). But possibly it was the stories, so graphic in nature and so difficult to digest, which made the process seem longer still. 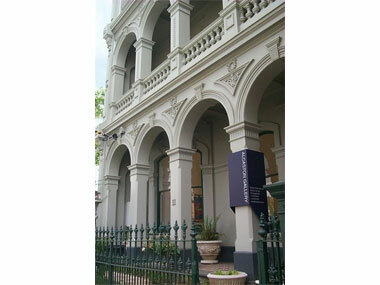 It had fallen to the State legal services to prepare, and in Victoria this meant the Victorian Aboriginal Legal Service (VALS), then located at 11 Brunswick Street in Fitzroy - somewhat fittingly where an Aboriginal art gallery (Alcaston) is housed today. Working at VALS at that time was a recent law graduate, David Gibson, whose role it was to interview family members of those Aboriginals who had died in custody. An immensely difficult task, especially for someone so young, but he was especially hired for the job because of his innate ability to relate to people, making him ideally suited to the role. This is David's reflection on that period, and his tribute to the people involved. The Royal Commission findings spoke largely to an Aboriginal youth, now the Elders of today - some of whom, like Uncle Max, are engaged in a new generational struggle, step by step building on the foundation of the Royal Commission and other achievements from that time, in an effort to bring today's Indigenous youth 'back home'. In 1987, the Royal Commission into Aboriginal Deaths in Custody was announced. I was a young lawyer that had just started work at the Victorian Aboriginal Legal Service. In those days it occupied a dilapidated terrace house at the top of Brunswick street. Phil Cooper had just taken over as Executive Director. The Board included Alf Bamblett and John Gorrie. VALS had been going since the early 70s - a steady stream of lawyers have passed through its doors and gone on to become judges, magistrates, senior barristers and solicitors. It provided legal representation statewide, on the smell of an oily rag. Six lawyers to cover the entire state. That it succeeded in doing this was due to the efforts of field officers like Herb Pettit, Gary Bamblett , Ken Saunders (later the first 'Koori' (Victorian Aboriginal) liaison officer at Victoria Police) and Richard Frankland (later to work with the Royal Commission). And all of it was driven by the engine room of the organisation - administrators Jan Muir, Kathy Nicholls and Pam Pederson (an Elder who now sits in the Koori Court, along with John Gorrie), all members of the remarkable Nicholls/Atkinson family (Sir Doug Nicholls was the family patriach). On front line at reception was Cilla Atkinson, now sadly passed away. It was a reception like no other. Now and then it would have to be evacuated when a troubled client let loose, but Cilla was always back there with a smile and a joke. Oh, and there was an accountant who disappeared with thousands of dollars to Fiji, but that’s another story. I think I'm still owed my super from that time. For a young practitioner it was a baptism by fire - often driving hours to a country court to do 15 or 20 pleas in a morning with clients you’d never met before (no matter what plans you’d made to catch up with clients the day before, they could never be found). Contested hearings at the drop of a hat. It either made you or finished you off. There were lawyers like Tom Munro, Jenny Clarke and Ann-Marie Baring who did this for years. But the real significance of that time in the late 80s was not the legal work, but political achievements driven by the Koori leadership of VALS. It was the lead up to Bicentennial celebrations, when the nation was being forced to confront the reality and consequences of its origins - an excluded indigenous underclass, who had become citizens of the country only 20 years before, who were being locked up in custody at rates many times that of the non-indigenous population. And an alarming number were dying in custody. It was a time for action and political doors were finally opening after years of effort by people like Phil Cooper and Alf Bamblett, and before them Jim Berg and Sir Doug Nicholls. 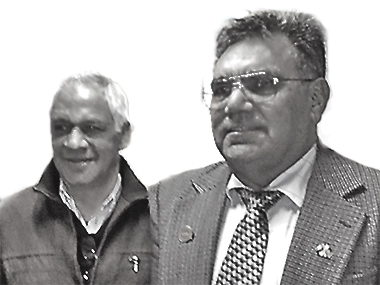 Phil and Alf were a team - adept at dealing with politicians to get a better deal for the Koori community, whether it was more funding or a change in police or court procedures. I had the privilege of sitting in on some of the meetings, very much a spectator, watching them wheel and deal with state and federal ministers. They were skilled politicians and powerful advocates for their cause. Phil and Alf signed up eminent QCs to support their cause - Ron Merkel and Ron Castan (who Phil referred to as the "the two Ronnies"), and also negotiated with police over changes in conditions for Aboriginal people in custody. And they were there in Canberra in late 1987 attending the opening of the Royal Commission. I travelled up with him to meet Paul’s parents, Dot and Monty Snr, who lived in Townsville. I drove with them to Yarrabah and saw the police lockup at Yarrabah where Paul had been mistreated. Like his brother, Paul was creative - he was an actor and dancer. He had attended the VCA. He had been on TV shows. He had felt keenly the loss of traditional land (Monty Snr had arranged holidays there but had to ask the permission of the farmer who owned the land). And he’d suffered in police custody twice - it was inconceivable that a non-Aboriginal of his stature would be treated in that way. Dot had a quiet determination. She had kept all the records relating to Paul - she wanted to do him justice. And yet there wasn't a driving bitterness. It was a family which must have endured much hardship but what was striking was the generosity of spirit. Monty Snr (a former stockman) was great company - a real joker. They just wanted to do the right thing by their son. It was also the time when the stolen generation was coming to light. I remember Phil Cooper telling me that he’d been to more than 20 primary schools, as his parents were trying to stay one step ahead of the authorities to prevent him from being removed. In 1989, VALS became involved in the James Savage case. James Savage was an Australian Aboriginal man who had been forcibly removed from his mother and was now on death row in Florida. His adoptive Salvation Army parents had left him there to live on the streets. Under Phil and Alf's leadership, VALS led a campaign. James Savage was ultimately spared. And, of course, the issue gathered steam from there. It's only looking back now that I realise what remarkable people I worked with and the distances they'd travelled in their life journeys. Phil Cooper and his 20 primary schools rising to negotiate with national politicians (I remembering him once celebrating a birthday which took him above the national average for Aboriginal males - I think he was in his late 30s). Herb Pettit, a former alcoholic who had lived the experiences of many who had died in custody, who became field officer and senior elder. Richard Frankland, who has become a nationally known writer and filmmaker. Boori Monty Pryor, who has gone on to become an internationally famous writer. The Nicholls/Atkinson family. Alf Bamblett, and the numerous organisations he has guided over the years. I ran out of steam after several years at VALS - I was like a tourist travelling through. But for these people it was a lifetime commitment and future generations - Koori and non-Koori - have been the beneficiaries of that effort. In my work now with Victorian Legal Aid, I see that many of the changes in police practices and custodial conditions come from that time, and from the efforts made by the Aboriginal members of VALS. It was a decade before I stepped back into a courtroom again, but when I did I realised I'd learnt a lot more than I realised - about dealing with people, about working under pressure. And I had the privilege of working with some remarkable people who got things done at a really important time. David Gibson is a Senior Public Defender at Victoria Legal Aid where he has worked for most of the last 10 years, and a member of the Victorian Bar. The previous 10 years were spent as a Government advisor specialising in criminal justice issues. As happy as he is in his current job, VALS remains the highlight of his career. 11 Brunswick St, Fitzroy, where VALS was located during the Royal Commission, and (somewhat fittingly) where an Aboriginal art gallery (Alcaston) is housed today. 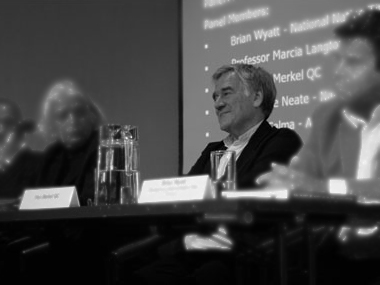 One of the two (then) eminent QCs recruited by Phil Cooper and Alf Bamblett for the Royal Commission, Ron Merkel, a champion of Indigenous rights, and current Chair of the Indigenous Art Code.